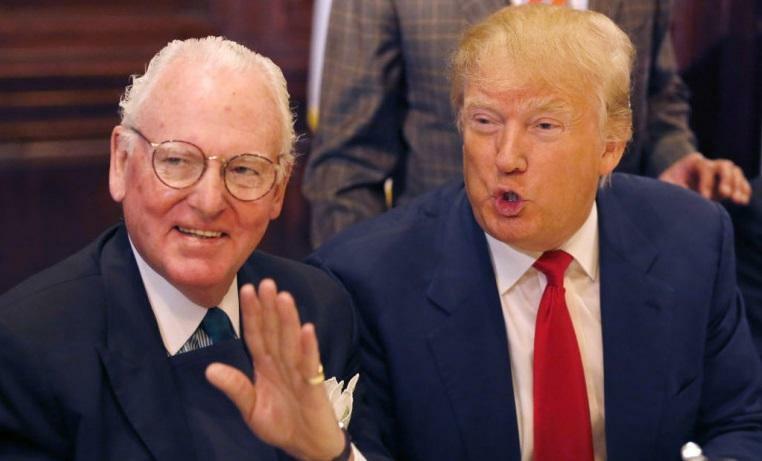 The FBI raided the City Hall office of Chicago Alderman and former Trump tax accountant of 12 years Edward Burke on Thursday morning, according to the Chicago Tribune. It is unknown whether the raid has anything to do with Trump, however Burke's tax office was not raided. Some have questioned whether the raid was political in nature, as Burke is standing for reelection in some 90 days, while his wife, Anne Burke, was just sworn in Thursday morning to another term on the Illinois Supreme Court. After arriving at City Hall, federal agents told employees to leave before papering over the glass windows to obstruct what was going on inside, before walking out with boxes and computers. The agency has been tight lipped about the operation. By 1:30 p.m., federal agents had left Burke’s ward office with boxes, at least three monitors and what appeared to be a computer. Burke issued a statement following the raid, predicting that he would not be taken down by the federal investigation. "As you are aware, there have previously been several other investigations such as this. In every instance we cooperated fully. And in every instance nothing has been found," said Burke. "So once again we will be cooperating fully and I am completely confident that at the end of the day nothing will be found amiss in this instance either." No arrests have been made, or are imminent, according to the Tribune, citing a law enforcement source, while confirming that agents did not search Burke's law office. Burke has been the longtime chairman of the City Council's Finance Committee - where he has controlled a large degree of City Hall's legislative purse strings since 1969. He is running for re-election for a record 14th term, according to the Tribune. Ald. Howard Brookins, who has offices next to Burke’s at City Hall, said he didn’t know what was going on behind the brown paper covering Burke’s office doors. But he questioned whether federal agents would conduct raids of an official set to stand for re-election in February. “I listen to the news and read the papers, and I thought they didn’t do anything that close to an election, so it’s shocking to me as to how you, or why something like this would happen some 90 days before an election,” Brookins told a scrum of reporters. Burke’s wife, Anne Burke, just won retention to another term on the Illinois Supreme Court. She was sworn-in during a private ceremony Thursday morning in Chicago. Burke, who is celebrating his 50th year on the council, holds the record for Chicago’s longest-serving alderman. Burke follows in the footsteps of his father, Ald. Joseph P. Burke, who died of lung cancer while in office - and has held the position ever since. As Trump's former tax attorney of 12 years, Burke negotiated savings of more than $14.1 million in taxes by convincing the city to lower the value of condos, hotel rooms and retail spaces owned by Trump. Burke, 74, parted ways with Trump in June, citing "Irreconcilable differences."